Ulricehamns Kallbadhus Association own and run Ulricehamns Kallbadhus. 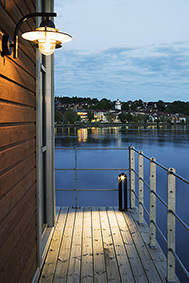 The association was formed in 2005 with a common desire to build a new bathhouse in Ulricehamn, which was completed in 2008. We are a non-profit organization with approximately 500 members, with no public funding. The many volunteers who help out with the cleaning and maintenance of various types are who make this buisiness possible. We also have good support from companies, associations and private donors, to whom we are extremely grateful. The business is also dependent on our visitors paying the low ticket price for the use of the bath house. In return, the bathers have access to a clean and modern facility which is open 06am to 10pm, every day of the year. Support the association by becoming a member. It costs 200 SEK per person per year. You can pay the membership fee through your bank to bg 5413-8409. Mark the payment with your membership number or your name and address, if you’ve not previously been a member. Membership includes certain membership benefits such as discounted rates at some companies in Ulricehamn and the opportunity to participate in themed evenings, exclusivley for our members. Bathing is not included in the membership fee, please visit Priser on the Bathe page. You can also purchase an annual pass, which costs 1200 SEK, for the opportunity to use the bath house all year round. The membership fee is included in the price.